From the start, Ceravolo has captivated audiences with the unique and visual excitement of his art. His ability to so skillfully capture the physical, as well as the inner qualities of his subjects, and to create excitement and depth with the addition of his “floating” Illusions to the paintings, blend into a combination of abstract and realistic work filled with color and texture. For more than thirty years, the trend-setting style of Ceravolo’s large-scale, provocative paintings has received international acclaim. While photographing a Rod Stewart concert Ceravolo thought it would be interesting to create a large portrait of the singer. He was invited backstage and Rod Stewart and Ceravolo set up a day to photograph the singer for his 8 ft tall oil portrait at the Pierre Hotel in New York City the next day. Rod and Elton John were great friends and the next Rock and Roll portrait commission was Elton himself. I met with Elton several times, recalls Ceravolo, to select the image he liked best for his painting. “Circus”, the Rock music magazine did a story on Ceravolo called ” Rock and Roll Painter” New York’s newspaper “Newsday” around the same time, did a story called “Painter of the Stars of Rock” and Ceravolo’s next private Rock portrait commission was for Alice Cooper. Ceravolo’s paintings came to popular attention when he was commissioned to create six large-scale portraits for the lobby of The Palladium Theatre, in New York City. 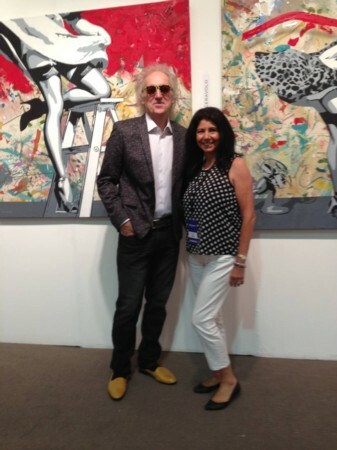 In an interview, New York concert producer Ron Delsener said that “When a musical artist of tremendous stature plays the Palladium Theatre, we commission Ceravolo to paint their portrait for the lobby of the theatre to honor and commemorate their performance.” In addition to these, Ceravolo’s paintings are in many influential corporate and private collections, including: Elton John, Rod Stewart, Hugh Hefner, David Brenner, Monique Van Vooren, Warner Brothers and RCA Records to name a few.